Welcome to Clear View of Broward, your Fort Lauderdale, Florida retractable and motorized screen authority. Clear View Motion Screen Systems smoothly slide into place transforming your outdoor living space into a fresh, ventilated, pest-free environment. You and your family will completely enjoy all of the amenities of your home day or night, anytime you desire. There are also a variety of screen meshes available that offer solar protection, privacy and full ventilation. Clear View Retractable Screens™ can stow away out of sight, safe and secure when not in use. Safe-Glide Speed Reducer™ Patented design lets door retract at safe speed preventing damage and slamming effect. Flexible mounting design specifically designed to mount on the surface or in the recess area of any door or window. Left or right openings. 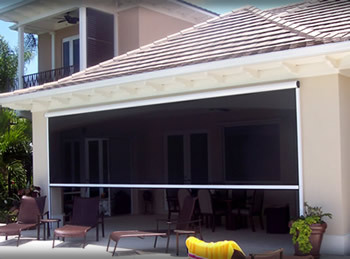 Providing patio screen, door screens, window screen and garage door screening solutions to: Fort Lauderdale, FL, Sunrise, FL, Wilton Manors, FL, Oakland Park, FL, Lauderhill, FL, North Andrews Gardens, FL, Dania Beach, FL, Lauderdale Lakes, FL, Plantation, FL, Davie, FL, Hollywood, FL, Pompano Beach, FL, North Lauderdale, FL, Tamarac, FL, Cooper City, FL, Coconut Creek, FL and other Broward County Florida areas.